God Listens When You're Afraid: Prayers for When Animals Scare You. Pilgrim Press, 2006. The fourth book in the GOD LISTENS series, a one-of-a-kind series of prayers for children who love animals. Written from a child's viewpoint, the book contains 29 prayers that address animals that some children may be afriad of and some of the common fears associated with them. Topics include: things that fly and bite: bees, wasps, mosquitoes; spiderwebs; sharks; snakes; dogs who bite; and many others. God Listens to Your Care: Prayers for All the Animals of the World. Pilgrim Press, 2005. God Listens to Your Love: Prayers for Living with Animal Friends. Pilgrim Press, 2005. Written from a child's viewpoint, the book contains over 30 prayers that guide a child in relationship with a new animal friend. The topics include when a new animal friend joins the family, a prayer of thanksgiving, the joy of feeding an animal, a prayer for a missing animal friend; and about animals going to heaven. God Listens When You Are Sad: Prayers When Your Animal Friend is Sick or Dies. Pilgrim Press, 2005. Follows the mourning process after one has experienced the sickness and death of a beloved friend. 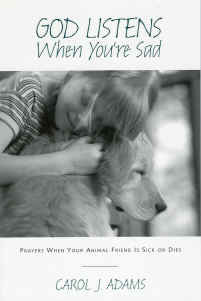 The book offers prayers that recognize various aspects of a child's grief -- the difficulty of understanding sickness and death, the feeling of worry and fear, having a dream about the deceased animal, one's physical experience of grief, and the sense that others don't totally understand what the child/individual is going through. Recommend by therapists for anyone mourning the death of a beloved animal or experiencing the aging of a companion animal. This wonderful God Listens series of books are now out of print and Carol J. Adams has graciously offered to sell all four books in the series for $20.00 US including postage, while supply lasts.